At Huia, the creation of good wine and a commitment to the environment go hand in hand. The result is elegant, hand crafted fully organic & biodynamic wines that go to help define the potential of Marlborough. To expand their offerings and create a more "intro" priced Marlborough label, Claire & Mike created Hunky Dory- a blend of estate and purchased fruit (all certified organic) designed to make for easy, accessible and delicious drinking. The Sauvignon Blanc grapes are sourced primarily from three vineyard sites. The Rapaura vineyard provides richly flavoured Sauvignon Blanc grapes that reveal a broad expression of tropical, passionfruit and guava characteristics. From the StrawLodge vineyard on the West Coast road where the fruit flavours are softer producing luscious lemon and lime acidity. And finally the Anderlane vineyard, that is located between the other two sites and brings the quintessential gooseberry and fine acidity of this area. Hunky Dory Sauvignon Blanc is succulent, offering tropical fruit notes packed with fresh gooseberry and lime flavours. This wine has a full flavoured lingering finish and is designed to meet expectations of a true Marlborough Sauvignon Blanc . 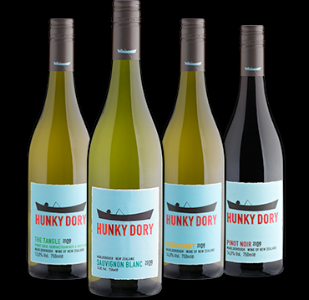 The Hunky Dory The Tangle is the only wine in the Hunky Dory range that is Estate grown. It is grown on our Winsome Vineyard in the Riverlands Southern Valley region of Marlborough. In this region the soils are clay based with some areas of sand and occasional stones. These clay soils respond well to the aeration provided by under vine weeding. The vines display low vigour and are planted five vines to a bay to create greater density in the canopy. A sunny and warm growing season ripened the grapes fully. The grapes are de‐stemmed and crushed before being pressed. After settling, the juice is racked to tank for fermentation. The blend is 10% Riesling, 55% Pinot Gris and 35% Gewurztraminer. On the nose honeysuckle, jasmine, quince, lime and lemon abound. Lovely ripe apple, lychee and mandarin flavours fill out the palate giving a delicious dollop of fruit. The full flavoured wine is slightly spicy with a lingering smooth balanced finish. Hunky Dory Pinot Noir is sourced from the Strawlodge and Andahlane vineyards running off the West Coast Road in the upper Wairau Valley area of Marlborough and Tobermore Vineyard in the Rapaura region. The grape vines grow in a mixture of glacial outwash – soils exhibiting a mix of clay and stony gravels. Our Pinot Noir is hand-picked and then de-stemmed to tank for fermentation. Once the wine is racked off, it settles spending ten months in French oak barrels before being blended and bottled. The bouquet is expressed with dark plum and cherry, spice and some vanilla. The palate has soft dark cherry and berryfruit flavours with some savoury and spice notes. The vanilla pod from the French oak melds well with the grape tannins and the wine is very drinkable.